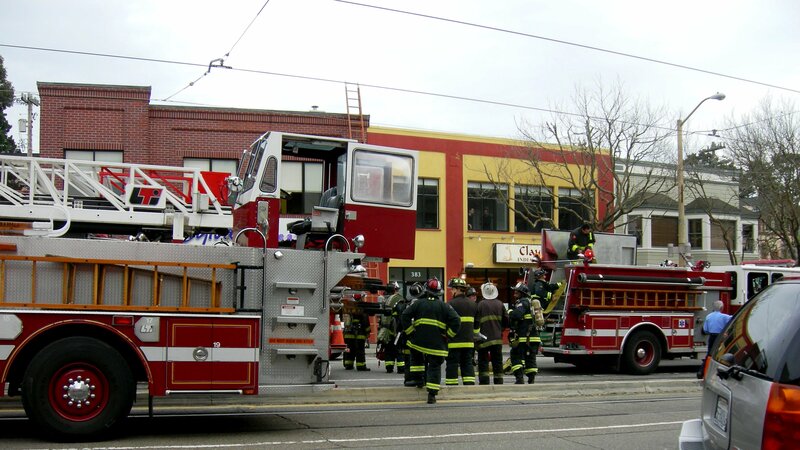 We were in West Portal on Feb 25th afternoon, when the sirens started sounding, from all around us. They were converging on the last block of the shopping village, where, incidentally, we had parked. Several fire-trucks were arriving, and someone with a gurney, and all manner of emergency vehicles. It was an impressive response. No fire was visible. A ladder leaned against the wall of the Sylvan Learning Center, next to the Clay Oven restaurant. After a while, they started packing everything up. “Was it a false alarm?” I asked one of the responders. A block above the activity, the Muni trains – and their passengers – waited for the whole thing to clear. Traffic was blocked. Even as I left, things were sorting out and the emergency vehicles departing. Elapsed time, maybe 30 minutes.